Next Stop BROADWAY® is a week-long performing arts program consisting of classes, workshops, and rehearsals focused on classic Broadway shows. Participants (“cast members”) learn songs and choreography from two hit shows from the “Golden Age of Broadway” and create their own presentations based on shows in the upcoming DPAC season and other hit musicals. In addition to dance and vocal training, the program includes a mid-week “edu-tainment” segment, highlighted with film clips of Broadway shows. 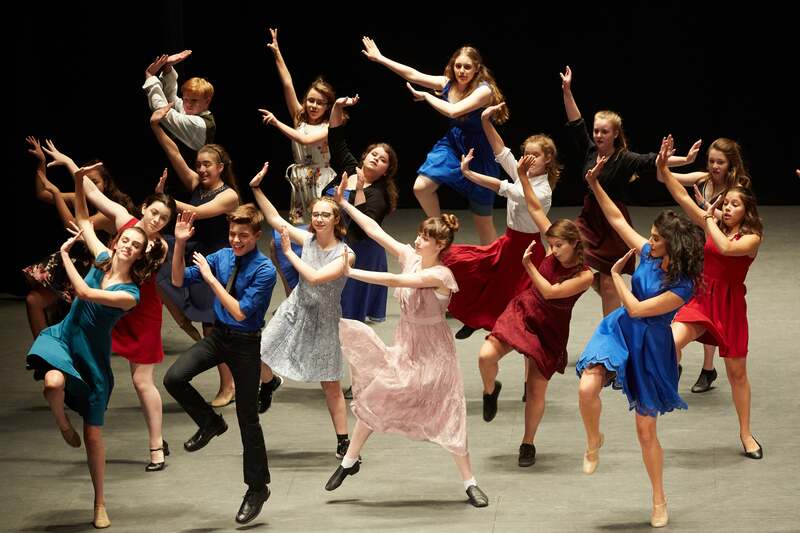 Next Stop BROADWAY® will take place at DPAC, and will culminate with an “Opening Night” performance for family and friends on Friday afternoon followed by a cast party in DPAC’s Skyline Lounge. Paid registrations are limited to 80 children ages 10-17 by July 1, 2019, and are accepted on a first-come, first-served basis. 20 full scholarships for the week will be awarded in April on a non-competitive basis to children with financial need and an interest in the performing arts. We apologize, but we have reached capacity for our Next Stop Broadway 2019 Musical Theatre Program. To put your name on a wait list, please click here. Mr. Parise began his professional theatrical career as a performer at the age of 10 in a production of OLIVER! with Sid Caesar. He appeared in the first National tour of A CHORUS LINE and was on Broadway in 42ND STREET, ME AND MY GIRL, and CITY OF ANGELS. On the other side of the footlights, Mr. Parise has directed and/or choreographed HELLO, DOLLY starring Madeline Kahn, WHERE'S CHARLEY? starring Jo Sullivan and Emily Loesser, MAME, SEVEN BRIDES FOR SEVEN BROTHERS, THE MUSIC MAN, CRAZY FOR YOU, DAMES AT SEA, ON THE 20TH CENTURY, FUNNY GIRL, LA CAGE AUX FOLLES, OLIVER, CINDERELLA, SOUTH PACIFIC, and National companies of ANYTHING GOES, GREASE!, 42ND STREET and ME AND MY GIRL. Off-Broadway credits include choreography for PIRATES OF PENZANCE (Lucille Lortel Nomination), co-choreography for PAGEANT, movement for RAFT OF THE MEDUSA, and co-direction and staging for BALANCING ACT, by "Mr. Nunsense", Dan Goggin. Other New York credits include MACY'S 100th ANNIVERSARY CELEBRATION in Herald Square, MACY’S THANKSGIVING DAY PARADE, WEIL AND LENYA for Kurt Weil's centennial, and the staging of "Raining in My Heart" for Bernadette Peters' Carnegie Hall debut as well as Ms. Peters’ Radio City Music Hall concert. Internationally, Mr. Parise has mounted companies of 42ND STREET in London, Australia, New Zealand, and Korea, ME AND MY GIRL in Mexico City, ANYTHING GOES at the Theater Des Westens in Berlin, and has choreographed for Italian TV in Milan. Since 1996, Mr. Parise has directed the Hasty Pudding Theatricals at Harvard University. Teaching credits include master classes throughout the United States and abroad with such organizations as AMDA, Boston Ballet, New Zealand School of Dance, and the Philadelphia College of Performing arts. Mr. Parise created TAP! and TAP 2! for Fleet Boston's Family Music Series. Mr. Parise created, co-authored, and directed SOPHIE…the Red Hot Mama Revusical. He is also the writer and director for the St. Louis Teen Talent Competition and the St. Louis High School Musical Theatre Awards. What time is the program? Monday-Thursday 8:30am-5pm, Friday 8:30am-7pm. Will lunch be provided? No, cast members are responsible for bringing their own lunches each day. What is the cost? $499.95. Save 20% by registering before March 11, 2019. Is there a deadline for scholarship applications? Yes, please submit your application no later than March 31, 2019. When will we know if we received the scholarship? All applicants will be contacted in April. Is there a deadline for registration? Yes, please register before July 1, 2019. Do note that this program is limited to 100 students (80 paid and 20 scholarship) and that spaces are available on a first come, first serve basis.